You are stranded somewhere after trying to start your car. The battery is dead and your cell phone is too. What do you do? Smile, because you got to review AGA’s 20,000 mAh A26 Jump Starter Battery, and it’s in your emergency bag. 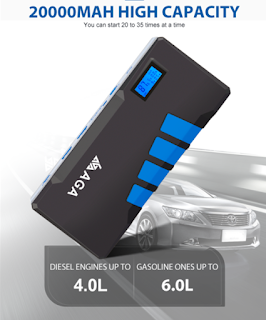 The AGA Jump Starter Battery Professional is small, and easy to use, yet it’s powerful enough to jump gas engines up to 6.0L and Diesel engines up to 5.0L. AGA knows their customers want a battery that is ready to go and therefore it is pre-charged. 1, short circuit protection design. 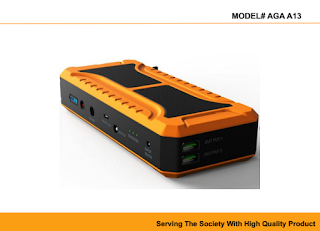 If the positive and negative metal parts of the battery clamp are clamped together after connected AGA car jump starter, the battery clamp will emit intelligent buzzing sound to prompt operation errors. What’s the difference between pocket jumper & heavy jump starter ? Having a jump pack with you when you travel can potentially mean that you don’t have to wait hours for roadside assistance. Many people break down, have to sit around until someone arrives to start their car, and waiting can usually the worst thing This is where having a jump pack with you can help. How jump packs work? The size of the pack Whether you have the best jump starter around, a budget starter that you may never use, all starters work in just about the same way. Their job is to act like a battery, and with the help of some alligator clamps, it can be attached to your car’s battery. When the jump pack is switched on it will transfer some of its power to the battery. In doing so, the pack helps to boost the cranking amps that are found inside the battery. Once the cranking amps have been boosted, the car should start.